We have two parking lots. 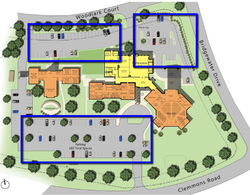 One large new parking lot in the front of the church (facing Clemmons Rd) and a smaller parking lot behind the church. Feel free to park in either. The back parking lot is a bit closer to the sanctuary, and the front parking lot is a bit closer to the Sunday School classes. You can enter the sanctuary multiple ways. There is an entrance directly into the Sanctuary from the back parking lot. 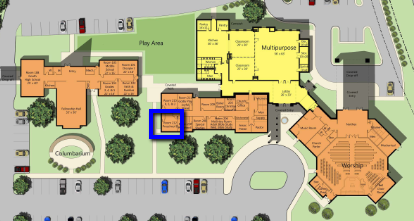 However, most will enter through the atrium as pictured below and go to the right to enter the Sanctuary or left to the Sunday School classes. If you have small children, you are welcome to bring them into the worship service with you. We also have a full-time nursery worker named Ms. Carolyn who will greet your children each Sunday along with member volunteers in the nursery room located in the 200 building. More about the nursery . It is a little far away, but we take all safety precautions. The entry doors will be locked during the service and Ms. Carolyn will be there the entire time. There are white visitor bags with crayons and paper located in the sanctuary entryway for children to use during the service. More about children in worship. ​Our worship services are built around the Bible, with the scripture lesson and sermon being the center of the service. Our 8:30 service is 45 to 50 minutes with the same scripture and similar sermon as 10:45. Most weeks our 10:45 service features a 15 to 30 member choir that helps lead the hymns and sings an anthem. The anthems range from Gospel to Traditional American Choral to an occasional Latin classic. During any month there will be a wide variety. During the summer months we frequently have soloist, trios and other small groups of our musicians offer their praise. We sing from a printed hymnal, three hymns at 10:45 and two at 8:30. We use the 2013 “Glory to God” hymnal from Westminster/John Knox Press. During the year our hand bell choirs lead in worship with anthems, offertories or preludes/postludes. And to be Sent with the Word. ​We have no “dress code” enforcers, and want everyone to feel welcome. On any given week there are blue jeans wearing folks sitting beside people in suits, heels beside Birkenstocks, and so on. Fine ladies hats don’t show up much but sometimes a nice one will appear! We care about you being here so much more than what you are wearing.